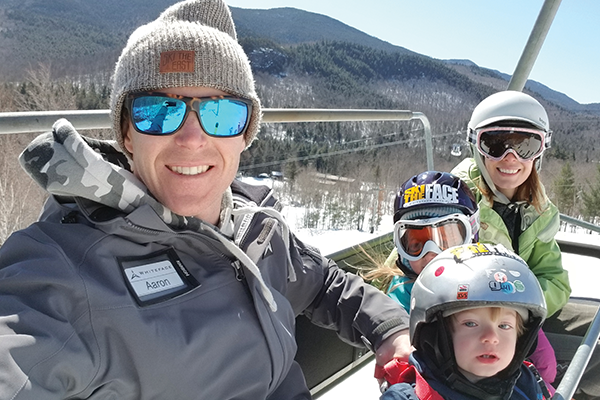 Aaron Kellett, general manager at Whiteface Mountain, grew up skiing the mountain. His father began working there in the 1980s on ski patrol and Aaron has worked almost every job there since his teens. He, better than anyone, knew that the writing was on the wall for the area’s cramped, outdated facilities. Over the recent Presidents’ Day Weekend alone, the area had some 6,400 skiers. “Our highs keep getting higher,” said Kellett. “Also, over 100,000 people visit us in the summer and over 200,000 visit us in the winter,” Kellett added, “so trying to work around the impact of the public was a major part of the project.” By late summer, it was all hands on deck for everyone involved in the construction project. Crews worked around lines for the gondola and adventure park, mountain bikers, and hiking and 4-wheel-drive tours. The challenges of the fast-paced renovations have been well worth it. Compared to past years, the changes to Whiteface Mountain are fantastic. Just the view of the lodge from the gondola makes one want to go inside, get warm, and eat a good lunch. Upstairs, the roof of the Cloudspin Bar and Grill has been raised, letting the light spill in. There is more seating with handsome Old Hickory furniture. Outside the white stucco has been replaced with warm wood. Downstairs, the enlarged cafeteria offers a variety of food options and also more light. Behind the scenes is an expanded and more efficient kitchen, a switch from oil to propane, insulation that has reduced the heating bill and numerous other efficiencies. Just putting insulation in the roof reduced the facility’s heating bill from $100,000 to under $50,000. But behind the scenes and away from the public, a lot of finishing work is still taking place. While the main guest area has seen huge improvements, the really big change at the mountain is the creation of a new learning center at the old Bear Den children’s area. There is a new 15,000-square-foot lodge that will house beginner ski and snowboard lessons for both children and adults, plus a new restaurant, pub, and cafeteria with a series of large, beautiful windows looking up the mountain. The parking areas have been expanded and a new higher capacity lift is in the works. Aaron Kellett said the old children’s area was drastically lacking. Mom and Dad have a lesson too, and they are on the other side. So, they have to get back out of the lodge, hop on the shuttle, get down to the base lodge, then figure out their whole lesson plan. It was logistically challenging for a family to do that. MLB Construction from Albany won the contract for the Bear Den Lodge, but encountered numerous hiccups from the beginning. For example, Heather Brunell, one of MLB’s project managers, explained that the original design called for large timbers that would take four months to deliver. Obviously, that didn’t fit into the tight project schedule, so they had the façade redesigned and, in the end, saved money, but lost time in the actual construction. The new lodge is half open this season and the second half—which will feature a bar, cafeteria, and efficient kitchen—will be open for the 2018–19 season. The total cost for the new Bear Den Lodge is about $5 million, the improvements to the old base lodge are a bit over $3 million, and in this phase, about $500,000 was spent on the mountain itself. Besides finishing the lodges, the plans this summer call for upgrades to the grooming fleet and a major renovation of the mountain’s snowmaking system. The goal is to make more snow faster for less money. Snowmaking is Whiteface’s biggest power draw, and modern snow guns are 10 times more efficient than traditional snow guns. Also, the freeze and thaw cycle of the past few years has created numerous challenges for making snow from Ausable River water, with the slush and anchor ice clogging the snowmaking intake. Whiteface is banking on doubling the size of its pump house to solve the problem. For us old-time skiers, this is all a bit mindboggling. Wherever one turns at the mountain, there is some kind of improvement or a plan in the works. Hopefully, the investment New York State has made will be returned in thousands of skier and snowboarder visits. For this everyday skier, the prospect of better snow, two beautiful lodges, better food, and maybe even better parking means I just can’t wait until next winter.